I completed phase 2 of my Highfields farmhouse, the living room and kitchen. I'm very happy with how it came out, and now I'm starting to fully appreciate my wonderful house. I also had a good look at the nursery again and made some changes, finally I'm happy with that too. Enjoy the story! Daisy Buttercup took a good look around her. Her best friend, Rosemary Bouquet, and her family is coming over for dinner and she wants everything to look perfect. She spend the whole day decorating the living room and kitchen. She managed to put everything back in its place while preparing dinner. And though she felt exhausted, she looked forward to spend some time with her friend, and also to show off her house. Daisy quickly went upstairs to check in on the twins. 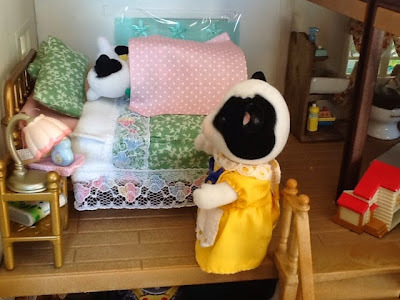 She managed to put them to bed early, and was relieved to see they were still fast asleep. 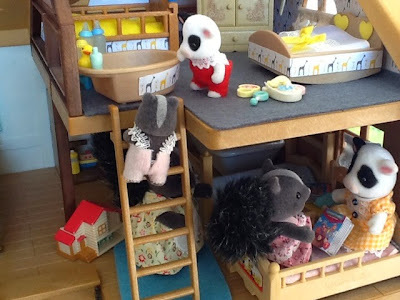 She decide to let them sleep in the main bedroom so that Cheddar and little Lavender can play in the nursery and of course she wanted to show the redecorated nursery to Rosemary too. 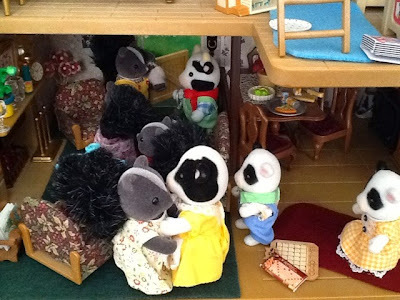 She found Annabell in the children's room, and could hear Hornbull washing up in the bathroom. It sounded like a hippopotamus was trapped in there. Annabell: Mommy, when will Jasmine be here? 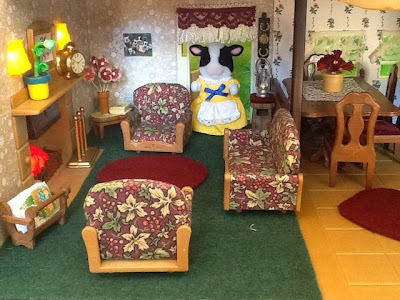 I want to show her my dollhouse. Daisy: Soon dear, will you actually let her play with it? Annabell: I think so, although she is not my best friend at school and not in my class, I like her and she is always so friendly. Daisy: Good girl, thank you for wanting to share your stuff, Honey. Do come down when you are finished here, I'm going to check on the boys. Daisy found the boys outside. It warmed her heart to see how protective Paddock was over his little brother, Cheddar. Since Cheddar started to show interest in boy's games and in playing outside, Paddock has take it upon himself to show his little brother around and introduce him to farm life. Daisy: Paddock, is everything alright with you two? Please watch out for Cheddar on that slide. Paddock: Yes mommy, he is a bit wild, but I'll take care of him. Just as Daisy was about to go in again, the Bouquets came around the corner of the house. Daisy: You are here, how wonderful. Come in, come in. 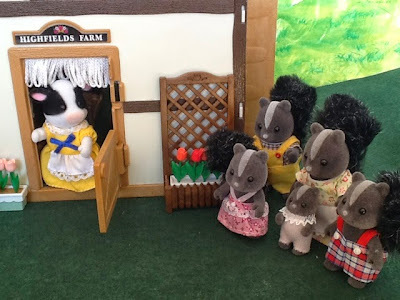 Rosemary: Sorry, we are a bit early, but the kids were becoming demanding, especially little Lavender, she couldn't wait to see Cheddar. Daisy: That is fine, we were waiting just for you. 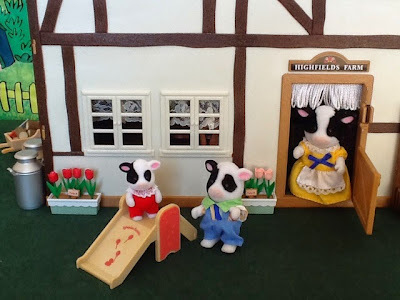 Stilton: Thanks for inviting us over, it is always wonderful to visit Highfields Farm. It has been so long. Lavender immediately ran over to the slide where Cheddar was still playing and Sage followed her. 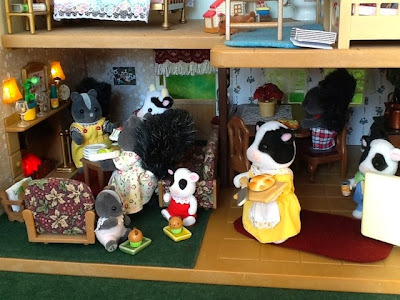 It has always been a shame that Daisy and Rosemary's children weren't the same age, as both of them would have loved for their children to be best friends too, but though both the boys and the girls differ by one year, they got along just fine, and as consolation at least Cheddar and Lavender were the same age. Daisy and her guests went inside. There were an audible intake of breath, when Rosemary entered the house. Hornbull was waiting at the door for them to welcome the guests. Jasmine went over to Annabell to greet her and the two girls disappeared upstairs. 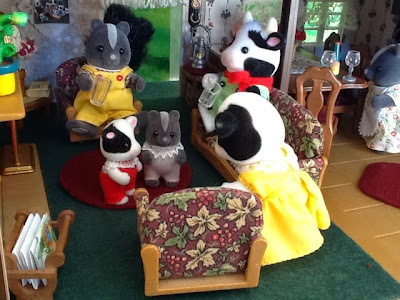 While the girls ran upstairs, the men helped themselves to a beer and Rosemary could get a good look around. Rosemary: Oh Daisy, I am so jealous. Look at how fabulous everything looks. And you did it all by yourself? I'm glad to see that you went for the green carpet instead of the maroon, like I suggested. Daisy: Thank you, it has been so exhausting, but I'm happy with the results too. And please don't mention the carpet to Hornbull. He also suggested the green one, and we had a big argument about it, because I wanted the maroon one, but after I heard your input I decided that you are right. He will never get over it if he knew that it was you who convinced me and not him. The two friends had a quiet giggle about Daisy's predicament, as Rosemary knew just too well what Daisy meant. They looked around some more, admiring the kitchen wallpaper and was just about to get some wine, when they were interrupted by Cheddar and Lavender. Cheddar: Mommy, may we go and play in our room. 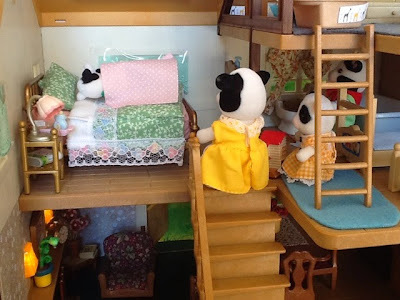 Daisy: Sure Cheds, just be careful not to wake the twins when you pass our room. 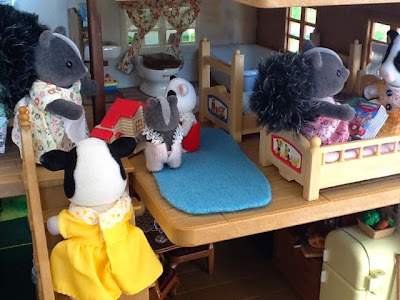 The little ones climbed up the stairs and Daisy invited Rosemary to come and have a look at the redecorated nursery. 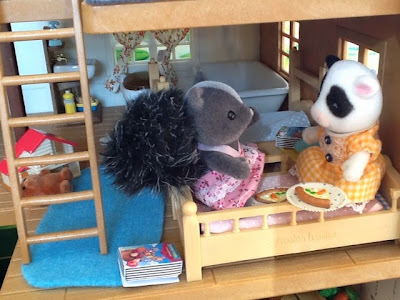 Daisy: Just pardon the rooms on the second floor, they will be phase 3 of my redecorating, but I'm still waiting for the kids bedroom linen, and the wallpaper for our room is taking ages to arrive. Rosemary: I can't wait to see that too. 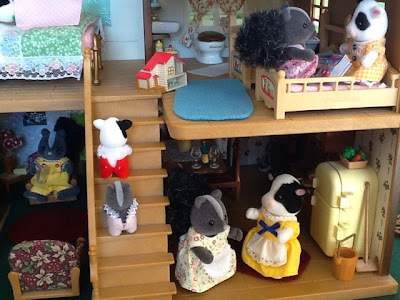 At the top of the stairs they were stopped abruptly by Cheddar, who first wanted to show his sister's dollhouse to Lavender. 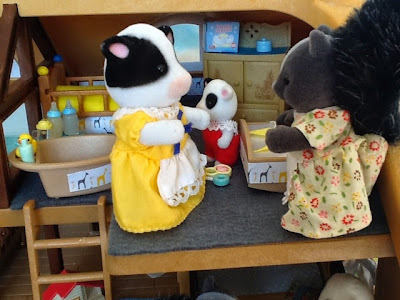 Cheddar: Look Lavender this is my sister Annabell's dollhouse, but we may not play with it, we are still too small and will break it. Lavender: Ooh it is so pretty. 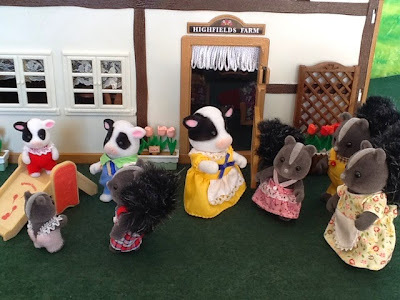 Daisy had to laugh at Cheddar, he had heard that phrase so many times before, that he started to sound exactly like Annabell. 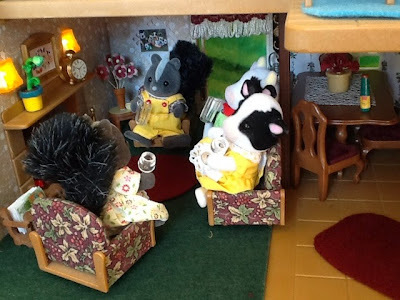 Daisy was glad to see that the girls were quietly reading and enjoying themselves. 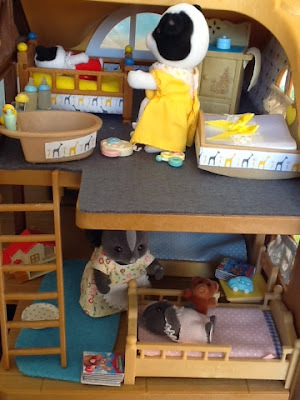 ...while Daisy checked in on the twins, who were still soundly asleep. In the nursery Rosemary was again at a loss for words. Daisy felt really proud of what she achieved with this one. 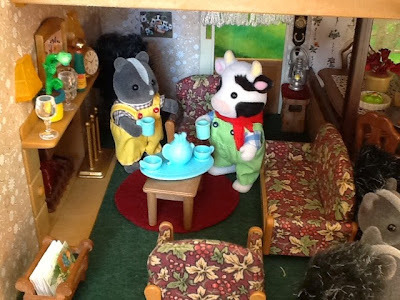 Rosemary: Daisy you have some talent, maybe I must get you to come and redo our Meadowcroft Cottage. Daisy: Well, at first it didn't look this good. 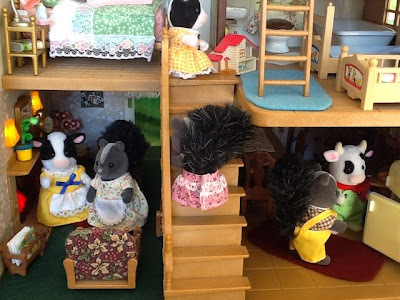 It just didn't look "together", so after nagging him for days, Hornbull gave me the idea of using the wallpaper to decorate the baby cot and bath too, and I was very fortunate to find material with the same print, that I could use for Cheddar's cot. Rosemary: It seems like Hornbull is the one with the hidden talents. Daisy: Again, let's keep that remark between the two of us. Finally the two friends could settle down with a glass of wine and do some proper catching up. 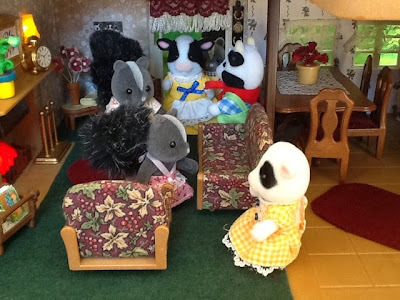 They discussed the new residents, the Meadows family, who is now living in an old stable on the farm. Speculated about the possibility that Mona Hazelnut is expecting a baby, wondered if Antonio Patches will ever show up and if he might have just deserted his wife and child, and had a nice laugh about Kate Periwinkle's parents in law that is now living with them. When it was almost completely dark outside Sage and Paddock finally came in, and loudly announced to their mothers just how hungry they were. Daisy took this as a sign that she must probably stop chatting and play the hostess. Rosemary quickly helped her to serve everyone. There were bran "facey" muffins for Cheddar and Lavendar, pizza for the older kids and some delicious different kinds of finger food for the adults. The girls enjoyed their pizza upstairs. Loud giggles could often be heard, so it was evident that they were having fun and a secret discussion that could not be done in front of adults, not to mention boys. After dinner Cheddar and Lavender crept onto their mother's laps and fell asleep. 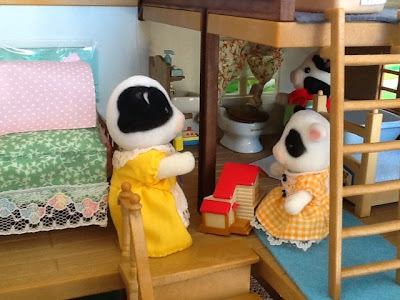 Cheddar were taken upstairs to his bed by Daisy, while Rosemary lay down Lavender in Annabell's bed. The girls quietly left the room and joined the boys for a game of scrabble in the living room. While the little ones were put to bed, Hornbull made some tea. Stilton: So how is your new Milk Manager coping? Hornbull: Oh Jack, really good. He is a good old chap, and I think he will be good for the farm. I really need the extra hand. 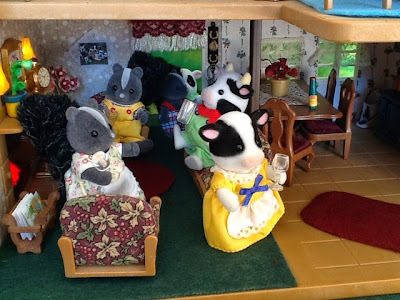 Stilton: And they are happy to be living in the old stable? Hornbull: I think so, they were just too glad and grateful to have a roof over their heads. It seems like they haven't always had it easy in life. Maisie did a wonderful job refurbishing it. Stilton: They do look like good people. You must bring them to The Harvester for dinner one night, so that we can have a proper introduction. Hornbull: We were actually thinking of inviting them tonight, but Daisy wanted to spent some time alone with Rosemary, so maybe next time. But I will take you up on your invitation, I can't miss a chance to have a taste at your delicious food. Too soon the evening ended. Everyone said there goodbyes and promises were made of a visit again very soon. Daisy: Thank you for coming over and for all the advice with the decorating. Rosemary: You did a great job and the advice I gave you is nothing compared with what you did alone, or should I rather say, what you and Hornbull did. The friends laughed at this and hugged each other. What a wonderful surprise after coming home from University! :) Hornbull sounds like a hippopotamus? :D great imagination! I loved this story very much, cause it's so realistic! The girls giggeling, the mothers talking... So familiar:). I'm looking forward to see the wallpaper of the parents' sleeping room. Thanks for the kind comment!!! Love this family and this house! Thx S!! Your feedback is always special, especially because I get so many of my ideas from you! Thank you for your very kind comments and compliments. I do appreciate them (blushes). I still cant believe I finally have this house! Nice to see Highfields farm full of life :) I love the decorations, especially the laces. Glad that you like the lace, it is quite hard to decorate such a big house perfectly! You have done such beautiful decorating, will you be re-furbishing the main bedroom? Mind you, I do like it as is. It was great to see the family settling in to their gorgeous home! the second floor will be part 3, but Im still trying to find wallpaper for the floor. Great decoration. I like the cozy living room. And the story is so closed to life. Thanks for the fun. Thx for the kind comment.